Songs I’ve written, recorded, and played everything on, except vocals (though I did write the lyrics, melodies, and harmonies). Drum sounds were played and programmed. The final track IS a “cover” song. 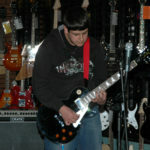 Kamran played with Green Day, see the story & video. 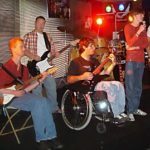 Student Hits Stage with Green Day ! 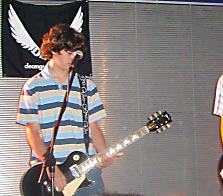 JULY 3, 2009: Not only did (my) 16 year old student Kamran Imran get his chance to join his favorite band on stage, but in front of 18,000 screaming fans at the Key Arena in Seattle he withstood the immense pressure of the situation and shined (and it was all filmed and uploaded to You Tube!). 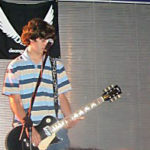 He aced every guitar chord and riff, including the perfectly on key vocal spot near the end of the 9 minute opus “Jesus of Suburbia”, as Billy Joe Armstrong held the microphone right to his face. Kamran was rewarded with backstage time and gifts from the band. More kudos followed: a home interview on the SF Bay Area’s ABC Nightly News broadcast, a drive time interview on Seattle’s top rock station KISW, and a front page blurb on the local pages of Santa Rosa’s Press Democrat! Talia, one of Lauren’s two children whose house I teach at. Dan drove to Walnut Creek from Oakland for his lessons. 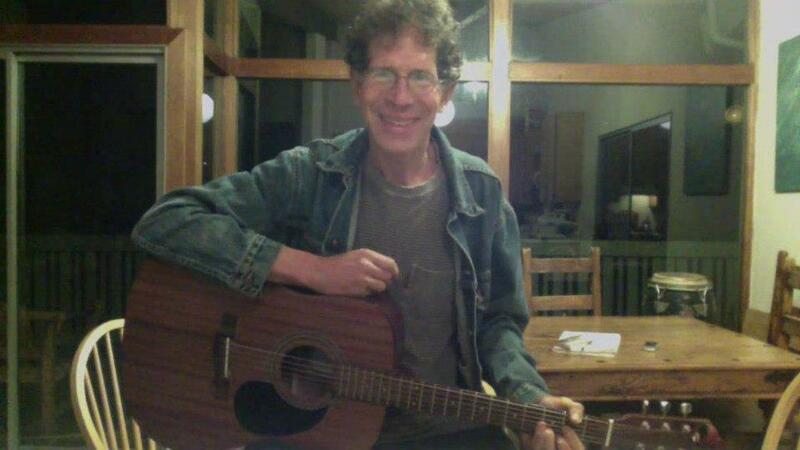 “Mark is an excellent, patient, friendly teacher, and fantastic guitar player. I’ve been playing guitar for decades but have never taken lessons up until now. I feel like each lesson unlocks a different secret of electric rock and blues guitar for me: pentatonic scales, palm mutes, tapping, bends, power chords, arpeggios, pinch harmonics and other techniques that I have yet to learn. He has also explained tablature to me, which has opened up a whole new world. 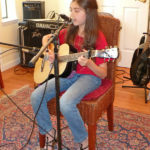 I show up each lesson with some ideas that I’d like covered, or a song that I’d like to learn. Mark understands what I’m trying to do, makes it look easy, and then, amazingly, makes it easy for me to do to the way he explains it and shows it. He then goes on to write out exercises in tablature for me to work on. It has been a positively motivating experience to practice during the week, knowing that I’ll have a lesson with Mark on the weekend to review what I’ve been working on. Me and Blake, one of Karly’s 3 kids whose house I teach at going on 6 years. 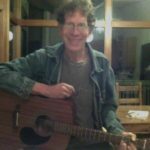 Mark Benjamin has been teaching my son guitar for a year. He is great with kids. He’s patient, kind, encouraging as well as professional and thorough. He picks up on any bad habits my son may have developed and corrects them immediately. He is very talented at getting around any frustrations my son encounters with a relaxed attitude and creative solutions. 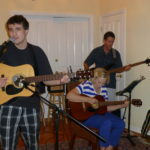 We have thoroughly enjoyed having him as our son’s guitar teacher and would highly recommend him. 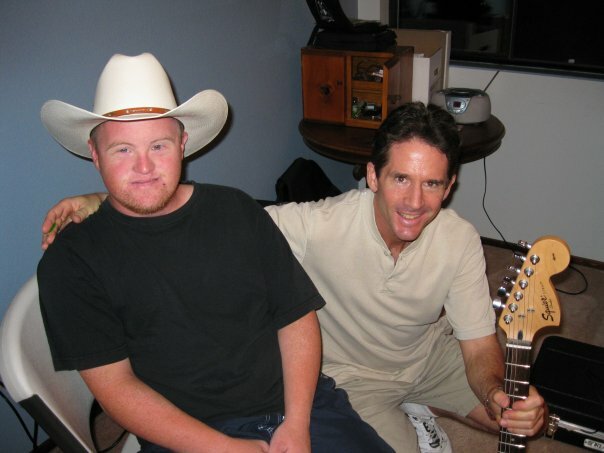 Eric- special needs student for 14 years and Randy in large group. 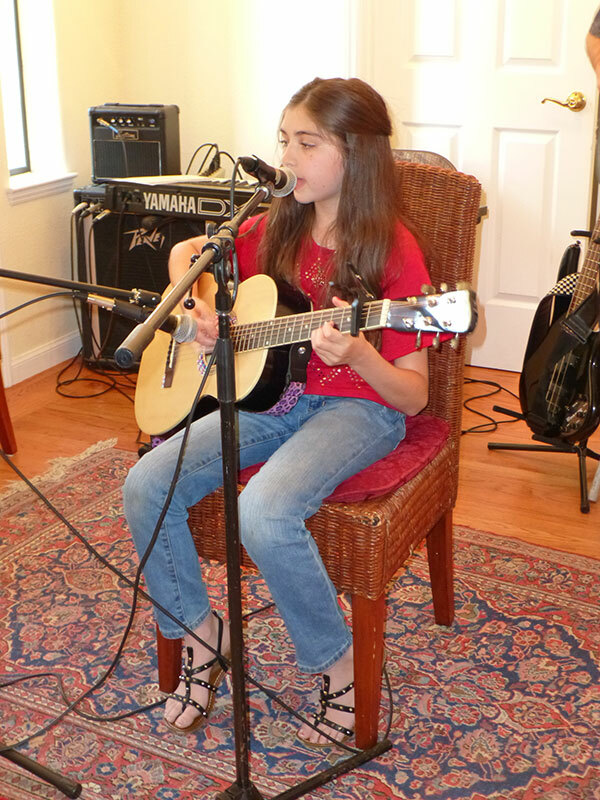 “Adele and I wanted to thank you for the on-going exceptional support you give Eric during his weekly guitar lessons. 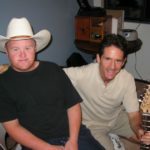 You are able to relate to Eric on his level and have obviously adjusted your teaching technique to work with his special needs. 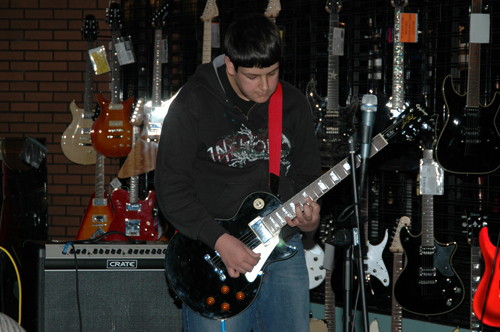 You are able to “hit the right buttons” with Eric and have kept him enthused and excited about the guitar for over 10 years. He really looks forward to Friday evenings, it’s often the highlight of his week. Your training goes beyond just playing the notes. Eric often amazes us with his knowledge of songs including singer, song writer, backup players and more. We always ask him “How do you know so much?” and he says “Mark told me”. We really appreciate all your efforts and the enthusiasm you have for your job. It has had a very positive impact on Eric’s life. With special needs student, Garitt, 4 years of lessons. 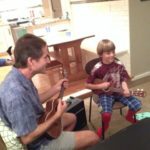 “Our son has taken guitar lessons from Mark B for the last 6 years…what a great experience it has been…he looks forward to his weekly session at our home with Mark. 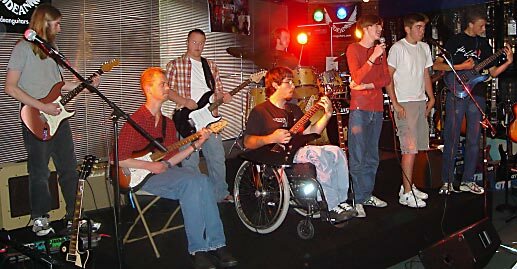 Garitt, who has special needs, has always had a passion for music. As parents, it was very difficult to find someone with the patience and musical talent to teach an individual with intellectual challenges. Mark as done a remarkable job teaching Garitt!! He can read chords and loves to jam and sing at all our family events. We are so grateful to Mark for his dedication and sensitivity to our son. Garitt has developed a hobby that he is able to accomplish independently at his own leisure. This has contributed to his great sense of self-esteem and passion for life! Ryan studied with me for over 5 years. 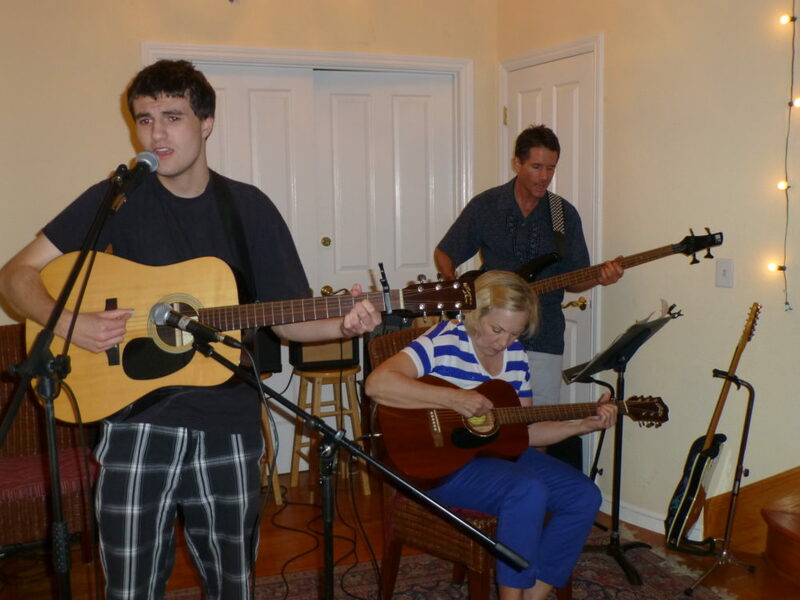 Jared, who is autistic, and Lynn with me at student concert, both did over 4 years of lessons. “My son has been taking lessons from Mark Benjamin for almost 3 years. 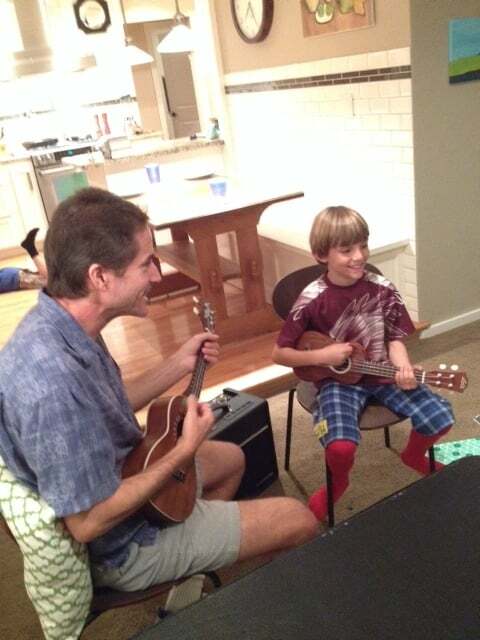 Mark is a FANTASTIC guitar teacher and I’m thrilled that our son has gone from having zero knowledge of reading music/playing an instrument to now being able to play over 40 songs well. “Wow! I happened onto Mark when I went to Jam Brothers to buy a guitar. I had never played before and wanted to learn Shawn at Jam Brothers told me about Mark, so I contacted him and started in learning….very slowly, I might add. Mark is such a great teacher. There’s never any pressure. I can go at my own pace, and he is super patient. He’s also an excellent guitarist…clearly knows his stuff. He has a terrific background in music theory also which I really appreciate.